Last month we were delighted to be the lead sponsor of the 2018 TTJ awards, a pivotal part of our 60th anniversary year. We joined with more than 400 industry colleagues to celebrate innovation and success within the sector. 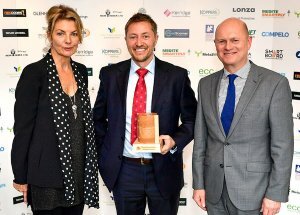 Pictured from l-r is host, Jo Caulfield, award winner Stuart Watts of International Plywood and our CEO Jonathan Grant.